You should know better than to compare different platforms on sunspider. It's more software than hardware dependant benchmark. Given the vastly different conclusions and what not, I think it would be interesting if Charlie and Anand had a roundtable discussion about the SoC space, both phone and tablet. Has Tegra had a noticeable lack of design wins? Has nVidia overpromised and underdelivered three times in a row? Or is Charlie exaggerating far too much? I'm making no judgement myself, since I really know very little about how phone and tablet manufacturers view the various SoC's. I feel like T2 underperformed because the software on it underperformed (see DX2), as Honeycomb was a pretty terrible release. 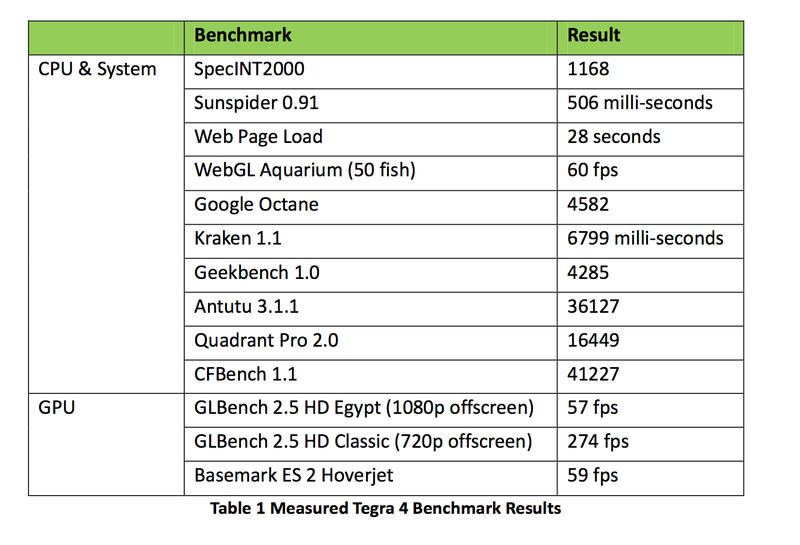 Tegra 3 didn't do poorly at all. It performed phenomenally as a cheap chip (though the high-clocked ones on high-end phones made no sense). 28nm was a must-have for a high-end chip that generation. DX2 and Honeycomb not being the same subject of course. A lot of what Charlie said is easily check-able. Tegra2 had a ton of design wins and almost no actual sales. Tegra3 has done phenomenally, but only in tablets and it's already been replaced in one or two. I think the most prophetic thing he said is the most obvious, unlike every previous generation they didn't announce a single design win for Tegra4. That to me speaks volumes. We'll know in time if it's just the vendetta or if his sources are correct. I've never heard of a chip maker doing a reference design and personally I just don't see that having any effect or why they would even do it. The manufacturers like to differentiate and the reference design takes that away, which again speaks to lack of manufacturer interest. Charlie tends to over exaggerate things but IMO he's been fairly spot on. Even with the highest revenue in their history profit was down almost 25% (which I attribute to the change to paying for wafer instead of good chips). FFRD is popular for companies that only produce the chips and not any phones themselves. Samsung has no need to do it, Apple either. Who's left? Qualcomm sells (almost) reference designs with their MDP, Intel's first two phones (Lava Xolo and Orange Santa Clara) were basically rebadged reference devices. Now NVidia's doing it. One advantage to having an FFRD is so that the customer can bring it to market faster and cheaper. OEM's like that and it also allows for chip manufacturers to get their stuff into the hands of smaller OEMs who don't have large R&D budgets. All the Tegra chips have had higher power consumption than their peers from other manufacturers. 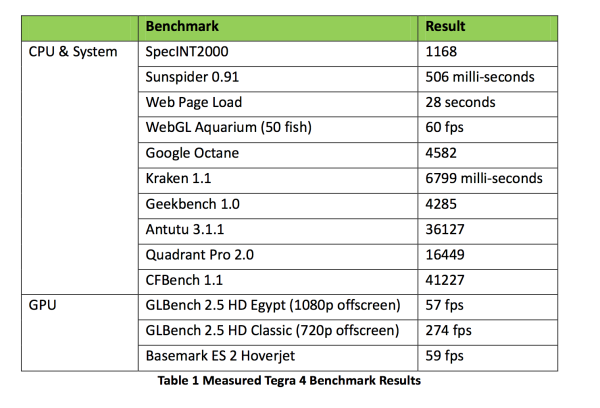 It looks like Tegra4 is no exception. They work well in tablets where it is less important, but poor battery life is a really good reason for OEM's to not make phones based on your chips. Seriously? If it was that important I'd rather pay for something like MPR. Charlie is usually good for a laugh and that's about it regarding NV. Though I've written some stuff about this site's bias recently (my titan article posts and the 660ti article comments), I don't think anandtech and semiaccurate sit at the same table. Anandtech isn't making stuff up, they're just leaving out 3/4 of the story IMHO (regarding my comments on the 14games etc that should be in the game suite & the two that shouldn't). Charlie just throws darts at a board for a large portion of his articles. IF you keep his articles (I did for a long time) and go back over them he's only right about 50%. Either he's getting WMD like UK info (ala bush and iraq, though I think they just moved them to syria...LOL we gave them ages to move them) or he just makes it up himself ("my deep mole in x company said blah blah"). There's no proof until ages later when most forget what he even said, right or wrong. Note there is NO COMMENT section on the site now. They're all blocked :) Ubergizmo called his site "half accurate". My data of old articles used to say the same :) I expect more than flipping a coin results in reporting. He gets credit for things like breaking the news on the bapco fiasco, but I'd say Van Smith gets credit for exposing not only that Intel OWNED the land they had their building on (they paid rent to Intel), Intel OWNED their domain name, and even had a hand in WRITING the code as Intel software engineers were on hand next door. Van covered it all YEARS before Charlie. Look up Van smith and vanshardware, a lot of that crap and the biased intel reporting forced Van to leave and probably dropped the price of Toms site to 1/4 of it's value when tom dumped it. He was worth MORE than anandtech before that stuff. Not sure of the value today, I'm talking back then. Biased reporting gets you killed if the right people keep pointing it out with DATA backing it. IF Tom's hadn't gone down that Intel love-in route he probably could have sold for much more. There's a reason Otellini said in 2006 that toms was his favorite tech site ;) Then in turn dumped the site as it's credibility tanked. Bapco was, and still is a sham. AMD/NV/VIA all left the consortium for a reason. I don't put much stock in anything from them (futuremark either). Tom's treatment of Van (even removed his bylines on stories) was downright disgusting. I stopped reading toms for about 5 years due to that crap in ~2001. He replaced every article the guy wrote with "THG staff". Total BS. Charlie does the same with NV hate as toms with Intel love. This crap costs credibility. Anandtech is coming close to the same thing on NV gpu's; Ryan's AMD love anyway, I'll bang away until he stops :) Funny how they never attack the data I provide here. I link to them at toms forums too, eventually that will begin to hurt as people look at the evidence and draw their own conclusions about his articles and in turn this site's credibility. If he continues on the next reviews (700's and 8000's) I'll get on a lot more forums linking the comments after the data dismantling (polite critique of course Ryan :)). In Chinese folklore, it is known as "The Gentleman of Weapons"